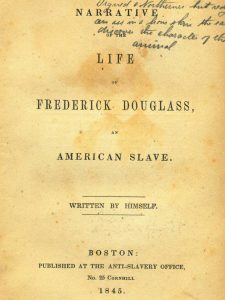 Narrative of the Life of Frederick Douglass published in 1845 is probably the most popular and well written Auto Biography written by former slave and then abolitionist Frederick Douglass. The narratives are simple, plain and yet powerful. It’s a story of a boy who wants to be free. Its his journey from a regular slave to self thought man who longs to become free and then ultimately escapes the slavery. It’s a story of despair, extreme violence of a human against other human, longing, love, knowledge, escape and fight. A must read. After the book got published. His friends and well wishers were very scared that all the attention would alert his ex-owner, Hugh Auld and he might try to get him back. So they sent Douglass on a tour to Ireland. In 1847 he returned to USA, even though his friends still feared. Upon his return he started publishing his first abolitionist newspaper, the The North Star. In 1848, he published an open letter to his ex-owner, Hugh Auld. “I am your fellow man, but not your slave” is worth reading along with the book. Did I say the book is in public domain and is available on ” target=”_blank”>Project Gutenberg. My mother and I were separated when I was but an infant—before I knew her as my mother. I have often been utterly astonished, since I came to the north, to find persons who could speak of the singing, among slaves, as evidence of their contentment and happiness. It is impossible to conceive of a greater mistake. Slaves sing most when they are most unhappy. The songs of the slave represent the sorrows of his heart; and he is relieved by them, only as an aching heart is relieved by its tears. What he most dreaded, that I most desired. What he most loved, that I most hated. That which to him was a great evil, to be carefully shunned, was to me a great good, to be diligently sought; and the argument which he so warmly urged, against my learning to read, only served to inspire me with a desire and determination to learn. In learning to read, I owe almost as much to the bitter opposition of my master, as to the kindly aid of my mistress. I acknowledge the benefit of both. The plan which I adopted, and the one by which I was most successful, was that of making friends of all the little white boys whom I met in the street. As many of these as I could, I converted into teachers. With their kindly aid, obtained at different times and in different places, I finally succeeded in learning to read. I would at times feel that learning to read had been a curse rather than a blessing. It had given me a view of my wretched condition, without the remedy. It opened my eyes to the horrible pit, but to no ladder upon which to get out. In moments of agony, I envied my fellow-slaves for their stupidity. I have often wished myself a beast. I preferred the condition of the meanest reptile to my own. Any thing, no matter what, to get rid of thinking! and from that time I resolved to run away. I looked forward to a time at which it would be safe for me to escape. I was too young to think of doing so immediately; besides, I wished to learn how to write, as I might have occasion to write my own pass. I consoled myself with the hope that I should one day find a good chance. Meanwhile, I would learn to write. For of all slaveholders with whom I have ever met, religious slaveholders are the worst. I remained firm, and, according to my resolution, on the third day of September, 1838, I left my chains, and succeeded in reaching New York without the slightest interruption of any kind. How I did so,—what means I adopted,—what direction I travelled, and by what mode of conveyance,—I must leave unexplained, for the reasons before mentioned. I love the pure, peaceable, and impartial Christianity of Christ: I therefore hate the corrupt, slaveholding, women-whipping, cradle-plundering, partial and hypocritical Christianity of this land. Thanks for sharing about Frederick Douglass..! !